This fully air conditioned unit in Oakwater resort is called Live, Laugh, Love and is a wonderful home away from home during your vacation. The main living area boasts a 50" plasma tv, with extended cable and a DVD player as well. The room has a large sofa and chair, and is decorated with jewel tones and tranquil colors that offer a stylish and relaxing atmosphere. There is high speed Internet access, and a house phone with free calling within USA. The kitchen is fully equipped with a dishwasher and all the other large and small appliances you need to be comfortable. All linens, towels, kitchen utensils and dishes are provided as well. The main are of the condo is open and bright, with the kitchen looking out over the dining room and living room. There are three spacious bedrooms. The master bedroom has a king size bed, a wall mounted, flat screen tv and a full ensuite with a walk in shower. This bedroom is located towards the back of the condo and overlooks the pool and clubhouse area. The queen bedroom also has a wall mounted, flat screen TV. The third bedroom has a twin over double bunk bed and another wall mounted, flat screen TV. These bedrooms share the hall bath. 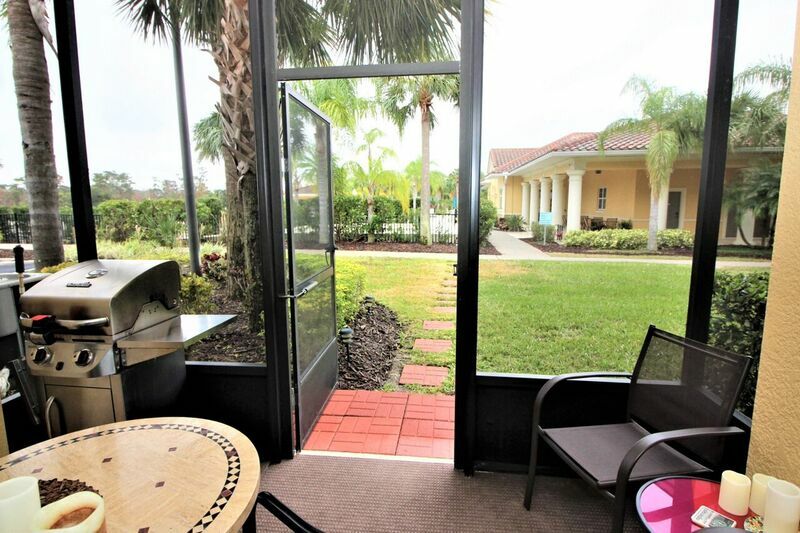 Sliding patio doors from the living room lead onto a screened in patio, from which you can enjoy a view of the Oakwater pool and clubhouse. Oakwater Resort has a great, zero entry pool, a spa and a splash deck for the kids. There is a lovely lake with a walking trail, and fishing available! The resort also has an exercise room, games room, and tennis court, basketball court and sand volleyball court. Oakwater resort, in addition to being close to Disney World, is also very close to all the other major theme parks and attractions. There are several golf course close by. THe resort is located close to shopping and restaurants. Taxes are an additional 12%. Accidental Property Insurance is added to all rentals ($49). You will be covered for any accidental breakage and no security deposit is necessary. My wife and I felt in love with your property, in fact we have decided on buying a similar if not the same in the future. House was set up great everything you need for a home away basicly just need clothes and shop for groceries.